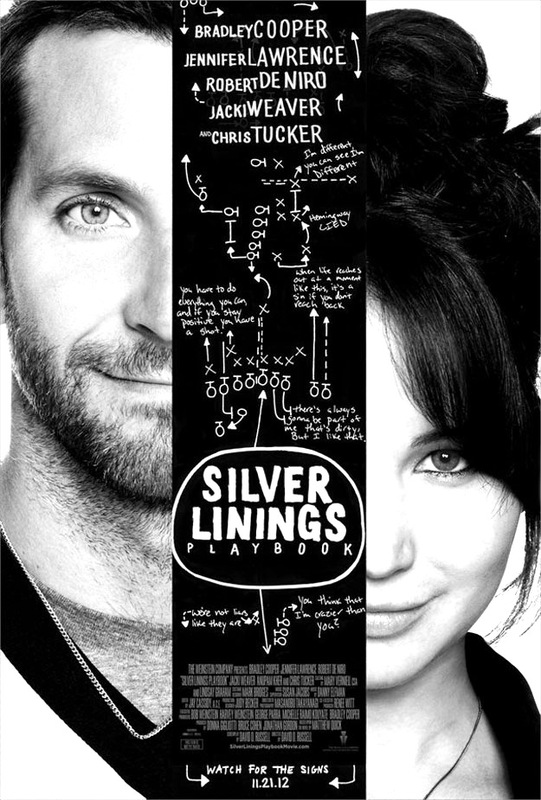 Life doesn't always go according to plan... Pat Solitano (Bradley Cooper) has lost everything--his house, his job, and his wife. He now finds himself living back with his mother (Jacki Weaver) and father (Robert DeNiro) after spending eight months in a state institution on a plea bargain. Pat is determined to rebuild his life, remain positive and reunite with his wife, despite the challenging circumstances of their separation. All Pat's parents want is for him to get back on his feet--and to share their family's obsession with the Philadelphia Eagles football team. When Pat meets Tiffany (Jennifer Lawrence), a mysterious girl with problems of her own, things get complicated. Tiffany offers to help Pat reconnect with his wife, but only if he'll do something very important for her in return. As their deal plays out, an unexpected bond begins to form between them, and silver linings appear in both of their lives. One thing to remember when watching a movie based from a book is to first watch the movie before reading the book. Believe me, the book kind of ruined this movie for me. I expected a lot from this movie and I was a little disappointed because some of the highlights in the book were not included in the movie. Though there are some scenes in the movie which I would love to be included in the book. So, 3 minutes into the movie, the scene is already altered. Danny isn't supposed to be riding with them since he should still be in the bad place and will only go home on Christmas eve. In the book: Danny was assaulted and his head was whacked by fellow rappers while hitting on a joint. In the book: Pat's father is not a touchy touchy person. In the movie: Pat's father welcomed him home. He even hugged him. In the book: Pat doesn't remember about the incident that resulted to him being admitted to a mental institution. In the movie: He remembers the incident. He knew why the Kenny G. song triggers his him. In the book: He spent 4 years in the hospital but he had an amnesia so he thought he was admitted there for just several months. In the movie: Pat spends 8 months in the hospital. In the book: When Pat sees Ronnie for the first time, they didn't acknowledge each other. In the movie: Pat was the first one to approach Ronnie. In the book: When they're running together, Pat and Tiffany don't talk to each other. Tiffany always waits for him outside his house. She knows his running schedule. In the movie: Tiffany talks to Pat when they had their first run. In the book: Jake plays the stock market. In the movie: She can dance, but not that good. In the movie: They're married for 3 years and 5 days. So it's Pat Solatano in the movie. It's Pat Peoples in the book. The part were Pat complained about the books he read while he comes barraging in his parent's bedroom is hilarious. I guess that made for a better effect than in what truly transpired in the book since he was basically talking to himself. The addition of Tiffany confronting Pat's dad when Pat didn’t attend their practice because he was sent by his dad to watch the eagles game versus the giants. That was fantastic! All those statistics. I like the fact that they changed the personality of Pat's father because I kind of hate him in the book. I think he has an Asperger's Syndrome or something. They toned it down to OCD in the movie. The chasing part in the end. When Tiffany ran after the dance exhibition. I loved that scene. It was kind of romantic. Pat's so sweet. That never happened in the book. I would also have wanted that snow scene at the end included in the movie, but it wasn't. Danny's character in the movie is really funny. I was glad he had more exposure here than in the book. It added an element to the movie. The dance exhibition. I was kind of excited for this part because it was really amazing in the book. And the movie kind of ruined it. I always keep on expecting Bonnie Tyler to belt out the turn around…. And of course I thought it was kind of funny imagining Bradley Cooper wearing the yellow tights. I was kind of disappointed because he didn't wear it in the movie. Though the choreography was kind of funny in the movie. The football games. I hope they showed more of the football games because it has a big part in the book. The part where Tiffany was motivating Pat by letting him listen to the song they're going to use in their dance. That was one of the most emotional parts of the book and I'm saddened because it wasn't emphasized in the book. They also failed to show Caitlin, who is Jake's wife in the book. Pat's parents were having marital problems in the book. I like that part because it should have added a bit of drama to the movie. I like the part where his father cooks his own food and washes his own laundry because his mom was on strike. She even wrote a letter to his dad stating her conditions. Bradley Cooper. I guess they should have chosen an actor bigger than Cooper because in the book he was described as having a similar body type with Arnold Schwarzeneger. Though I have no qualms with Cooper having been cast as Pat since he's once of my favorite actors. I must say that I'm in awe of his performance here. He acted so good. He was known for his comedy movies and I'm surprised he can deliver serious dialogues too. This should have also earned him an award. Jennifer Lawrence. Jennifer Lawrence is younger than the character in the book. Tiffany should be older by a few years to Pat. But then again, I love Jlaw so no complaints. :D Her acting prowess was amazing, especially that scene in the diner where she loses herself. That was truly one of the highlights of this movie. Because of this movie, she garnered her first Oscar's Best Actress trophy. I haven't seen the performance of the other nominees but she's really good in this movie. Overall, the movie was good. I enjoyed it. I had a good laugh. But, the book is much better than the movie. If you want to fully appreciate the story, be immense in the emotion evoke by Pat's and Tiffany's character, you have to read the book.